Synology’s DiskStation DS215j is a NAS device that can be used for a lot more than just housing and backing up your data. It features the latest version of the company's DiskStation Manager operating system (DSM 5.1), and it allows for a vast array of extra functionality to be added to the device, depending on your needs. So much can be done with this device in terms of managing, accessing, and using data; it’s almost like having another computer on your network. Physically, there is a Gigabit Ethernet port at the back along with a couple of USB ports (one is USB 3.0), and it has internal drive bays that can house either two 3.5in or 2.5in SATA hard drives. Since the DiskStation DS215j isn’t one of Synology’s higher-end offerings, there are some concessions when it comes to the hardware. You immediately notice this when it comes time to install the hard drives. The NAS needs to be separated in two pieces so that you can access the internal, fixed mounting points for the two drives, screw them in, and then replace the plastic cover. You don’t get the benefit of easily swappable drive bays, and that is one of the reasons the rest of the enclosure, apart from the chassis, is plastic. 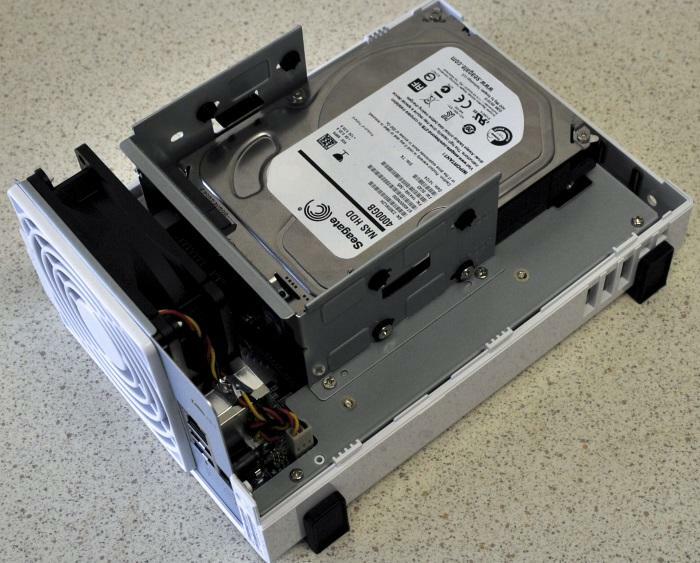 On Synology models where the drive bays are designed for hot-swapping the drives, the build quality of the exterior is metal, giving it better rigidity. Performance was good for transferring files. We used two 4TB Seagate NAS hard drives (ST4000VN000), which the device automatically set up in a Synology Hybrid RAID array, meaning one disk was used for fault tolerance. Reading large, sequential data to the NAS averaged a rate of 87.23 megabytes per second (MBps), while writing averaged 74.27MBps. For comparison, it's not as fast as something like the Thecus N2310, which is one of the fastest home NAS devices we've seen on our test network (102MBps read and 82MBps write), but it's much faster than Seagate's NAS device (61MBps read and 47MBps write). These results were taken using Gigabit Ethernet for our NAS and for our test PC, and our test PC had an AMD solid state drive. Installing the hard drives involves separating the DiskStation to access the internal drive bays. What makes the DS215j tick is an 800MHz, dual-core processor (Marvell Armada 375), and there is 512MB of RAM. This configuration, apart from ensuring that all your file transfers go smoothly and swiftly, is also what allows the DSM 5.1 operating system to offer so much. Now we will say this: the performance of the operating system on this NAS isn’t blazingly quick. You do notice a bit of a delay depending on the features that you are trying to access. Sometimes things take an extra second or two to execute, but the overall performance and usability of the operating system is still impressive. 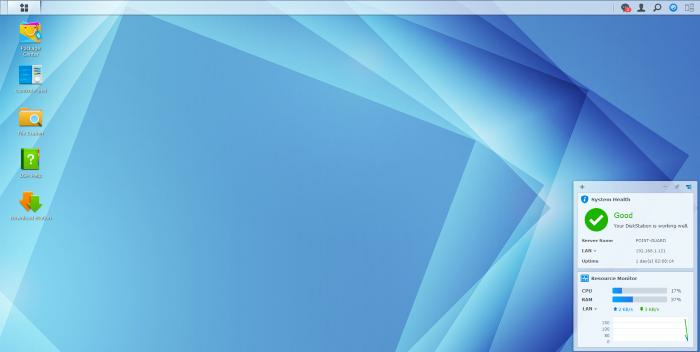 The DSM 5.1 software (the version at the time of testing) has a layout that’s reminiscent of a regular operating system, complete with a ‘taskbar’ at the top, an ‘app drawer’ or ‘start menu’, and the ability to house shortcut icons on its ‘desktop’. It’s an environment that shouldn’t take you too long to master, though there are many features to play with, and you might have to peruse the help files to find out how some things are meant to work. The main DSM 5.1 interface. 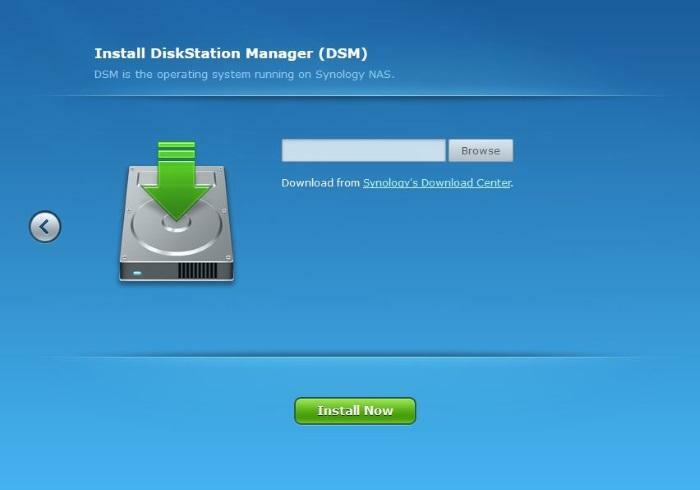 Note that you have to download and install DSM prior to being able to use the NAS, but it's not a difficult task. It just means it takes a bit longer to get up and running. 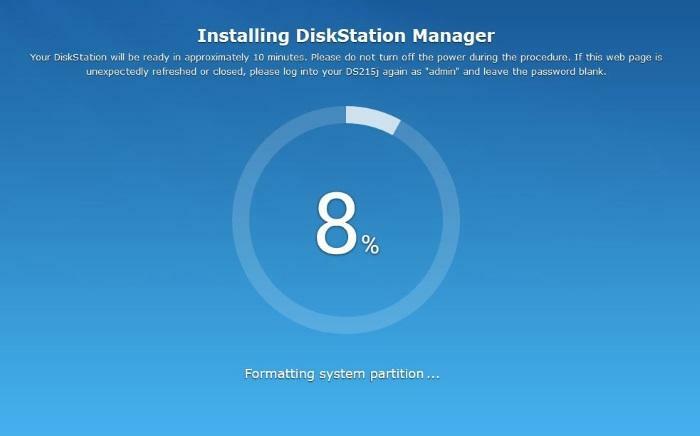 One of the main features of the DSM operating system is that it allows you to install extra packages in order to add functionality to the drive. This includes apps for managing downloads such as BitTorrent files (Download Station), streaming music (Audio Station and iTunes Server), and streaming videos (Video Station), as well as more advanced things such as setting up Web, email, VPN, and database servers. There is a WordPress app so that you can create a site directly on the NAS; you have the ability to use the NAS for recording from surveillance cameras; there is an app for Python so that you can run scripts on the NAS. Even a note-taking application can be installed and synched in your own personal Cloud. The most common apps you will want to use. Perhaps the most convenient features are the ones that allow the NAS to be accessed over the Internet from remote computers, and while on-the-go from smartphones and tablets. Synology offers a DNS service called QuickConnect, and if you use this service, you won’t have to fiddle much to get the NAS up and running for remote access. You simply register for the service using your email address, and then enter a name for your NAS, which will form part of the URL for the NAS. You will then be able to log in to the NAS remotely using your user account for the NAS, so make sure that you have selected a strong password for it. It makes it easy to log in to the NAS from anywhere in order to access and change its settings, and even to access files that are stored on it. 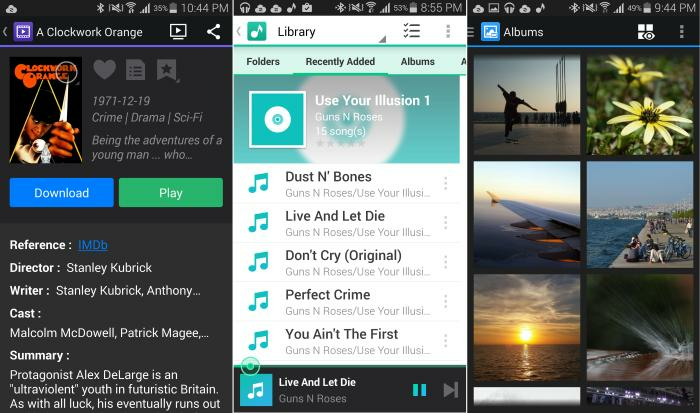 Apps for iOS and Android add further convenience, and there are different ones for accessing various files. For instance, there are dedicated apps for file management (DS file), for viewing photos (DS photo+), for streaming videos (DS video), and listening to music (DS audio). In order to use these media apps, you have to sort your content into the appropriate folders on the NAS (video, music, photos). From left to right: DS video (with DVD art and information shown), DS audio, and DS photo+. Cloud Station is the app that allows the NAS to operate as a personal Cloud device. Once this app is properly set up and running with the QuickConnect service, the NAS can be used as a storage location for synchronising specific data from phones, tablets, and computers. We should also point out that the DS photo+ app can be used to synchronise photos from a phone to the NAS, either when using mobile data, or only over Wi-Fi, but it initiates a notification for each file, which is annoying on the initial sync. Furthermore, there is an app called Cloud Sync that can be used to synchronise data between the DiskStation, and services such as Dropbox and Google Drive. On the left is the DS cloud app (whic works with Cloud Station), on the right is the DS file app. 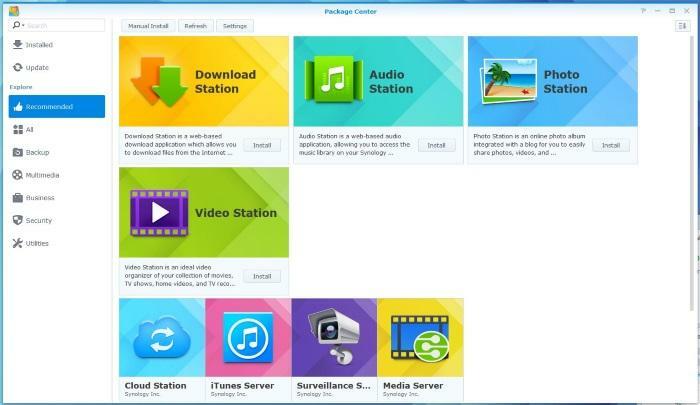 Note that the corresponding add-ins also have to be installed on the NAS in order for these mobile apps to work. On a home network, you can make use of iSCSI to implement network storage that looks like it's local storage on your computers (unlike drive mapping, it actually mounts a drive for you to save and access files), and you can back up data that's on the Synology either to USB drives, or to another NAS by using rsync. As we keep reiterating, there is plenty you can do with this NAS device, and it's up to you to make the most of it. We think it's an excellent choice for a home environment in which you want to store and stream videos and music. You can manage it and access content easily, even while you are not using a computer, thanks to the apps that are available, and you can even log into it remotely should you need to make use of its advanced features.